Last week’s post introduced Salvatore and our serendipitous meeting. We walked along a street that climbed one side of a valley. As we walked, he told us about the priest. As a young man in America, he converted to Roman Catholicism, and was rejected by his Protestant family because of it. They wanted nothing to do with him. But he felt called to the priesthood, and eventually studied in Rome. 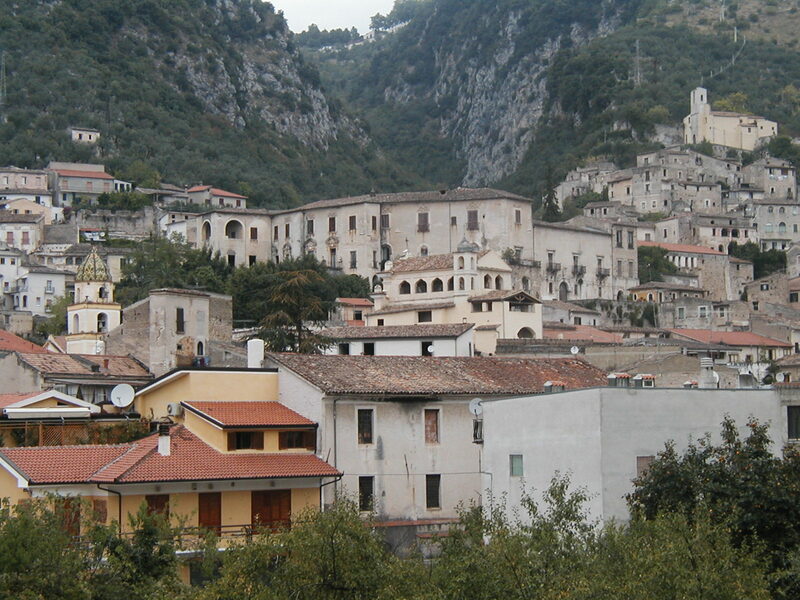 He was assigned to serve in Piedimonte Matese in the 1930s. His family in America cut him off completely, but he loved his life and work in Italy as a priest, and he taught English to those who wanted to learn, including Salvatore, who was a young teenager at the time. Then the war came. Mussolini joined the Axis powers in 1937, and as war gradually engulfed Europe, life in Italy became more and more difficult. The German presence in Italy grew to an oppressive level, and life was further disrupted by food shortages and military conscription. With the potential of American involvement in the war, the church and community authorities urged the priest to return to America, but he refused. Italy was his home, and he had no family waiting for him. Then came Pearl Harbor, and the United States entered the war. The ducal palace, largest building in this photo. Because it wasn’t safe for him to continue his service, the authorities prevailed upon the local duke to take him under his protection. Within the Palazzo Ducale, the priest was safe, but he could not leave the palace without risk of capture and imprisonment as an enemy alien. Almost two years later, in the fall of 1943, American and British forces began making their way north up the Italian peninsula. The Germans had established a camp west of Piedimonte Matesa, near the Volturno River, and as the Allied forces approached in October, the Germans began a slow retreat, destroying bridges, roads, and supplies in their wake. American forces continued their approach, shelling locations the Germans had occupied, causing additional damage to the war-ravaged town. The citizens were caught in the crossfire. The priest knew the Germans had all withdrawn from the town, and wanted to let the approaching Allied forces know. He attached a white flag to a pole, and set out for the American line, over the protests of the local citizens. When they realized he would not be dissuaded, a couple of them joined him as he walked down the main road directly into the Allied attack, waving the white flag and calling out to them in English. Finally, the shooting stopped. The Allies set up a camp where the Germans had been, and helped restore some order to the area. They needed help communicating with the local officials and citizens, and the priest recommended his young student, Salvatore, as their translator. Each day an army jeep driver picked up Salvatore to help with translation, and he was granted permission to be out after curfew so he could give Italian language lessons to the soldiers in the evenings. His father’s house had been bombed, and the soldiers helped them begin rebuilding. This entry was posted in History, Travel and tagged hero, history, Italy, Piedimonte Matese, travel, World War II. Bookmark the permalink. I’m enjoying the story and Salvatore’! Thank you for everything you do.